I heard the audio book during my daily commute and I literally felt like Ms. Hollis wrote this book for me. Maybe not the entire book, but definitely the chapter on “Not Having Enough Time” in the excuses section of the book. Ms. Hollis is straightforward and bold as she encourages women from all walks of life to finally get themselves into action and make, yes MAKE, their dreams come true. She addresses excuses we all use to avoid tackling on a project head-on. And, chances are, there is at least one excuse which resonates so deeply with you, Ms. Hollis will unpack and dismantle it in minutes. The audio book is rich with examples from her personal story of success and she keeps each point relevant to the pressures women face in modern-day society. A print copy of the book would be useful if like me, you love to underline, note-take or highlight sections to remember. However, if you’re also like me and have your day pretty much planned out between work and family, the audio book delivers her message rather effectively during your commute. I highly recommend this book for anyone who feels stuck or is unsure of where she’ll find the drive to truly go after her goals. Ms. Hollis will fire you up and get you going! (I hope). My first thought: the title is a gimmick to sell self-help in an inundated market. My second thought: yeah, I’ll buy it. I’m at the point in my life where I really don’t give a f*ck what people think most of the time…so, I’m hoping this book will enlighten the way to feel like this all of the time. I’m also hoping this book will be as honest and practical as its title suggests. Looking forward to some great nuggets to use on this journey of growth and search for equanimity I seem to have unwittingly embarked upon. Seems like a short straight-forward read…can’t wait to share my thoughts on this one. Have you read it? Would you recommend it? Summary from Goodreads: In this breathtaking novel—rich in history and adventure—The New York Times bestselling author Diana Gabaldon continues the story of Claire Randall and Jamie Fraser that began with the now-classic novel Outlander and continued in Dragonfly in Amber and Voyager. Once again spanning continents and centuries, Diana Gabaldon has created a work of sheer passion and brilliance…. It began at an ancient Scottish stone circle. There, a doorway, open to a select few, leads into the past—or the grave. Dr. Claire Randall survived the extraordinary passage, not once but twice. Her first trip swept her into the arms of Jamie Fraser, an eighteenth-century Scot whose love for her became a legend—a tale of tragic passion that ended with her return to the present to bear his child. Her second journey, two decades later, brought them together again in the American colonies. But Claire had left someone behind in the twentieth century—their daughter, Brianna…. 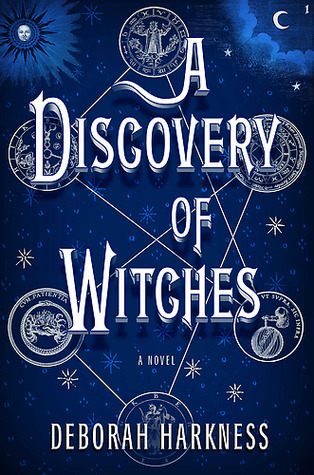 Now Brianna has made a disturbing discovery that sends her to the circle of stones and a terrifying leap into the unknown. In search of her mother and the father she has never met, she is risking her own future to try to change history … and to save their lives. But as Brianna plunges into an uncharted wilderness, a heartbreaking encounter may strand her forever in the past … or root her in the place she should be, where her heart and soul belong…. I loved Drums of Autumn. Almost as much as I loved Outlander. Almost. Even though I didn’t love Voyager, I read Drums of Autumn because it was there and I felt compelled to keep reading Claire and Jamie’s story. I’m glad I did. 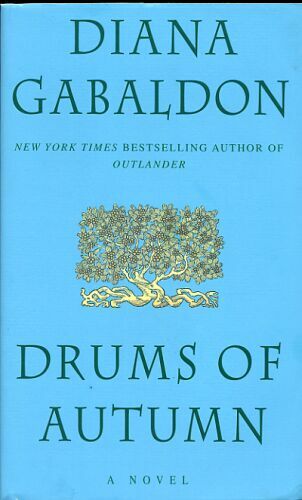 Drums of Autumn restored my faith in the series and I am now quickly moving through The Fiery Cross. Once again, Gabaldon delivers a strong novel about love, relationships and family. This time the Frasers are in America – the new world. And what a fierce world it is. Claire and Jamie battle the political landscape, wilderness, poverty, and the knowledge that war will once again find them with ferocious courage and determination to make a good life for themselves. Any romantic notions about time travel are quickly dissolved in this novel. Gabaldon paints a picture of a very hard life. The struggle to survive is the focus of each day. The constant preparation for long winters is exhausting. I wouldn’t last a month. I loved Brianna’s journey in this book – both literal and metaphorical – and absolutely loved when she finally finds her parents and meets Jamie. The adventures in this book are vast and full of unexpected turns. My mouth fell wide open with shock at certain points and I just could not put the book down. I thought Gabaldon did a nice job of developing Jamie and Brianna’s father/daughter relationship. They disagree on most things; their views on life and gender are completely alien to one another due to being from wildly different centuries. Yet, the love they have for each other helps them to bridge the abyss no matter how unforgivable their actions may seem. This book highlights new characters and conflicts that Jamie and Claire bravely face together. It also manages to maintain the deep love and romance between Jamie and Claire without being redundant or overly dramatic. I really loved the growth in Brianna’s character as well. Drums of Autum was so much fun read. It was entertaining and had just enough romance, intrigue, violence and adventure to leave one fully satisfied and ready to read the next installment upon closing the book.